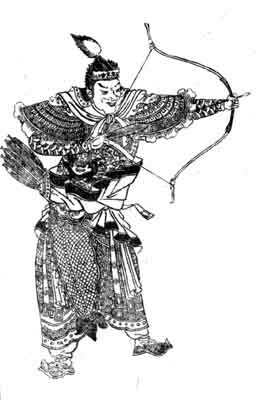 Crossbows were in use in China by the fifth century BCE and quickly became an important element in the warfare of the Warring States period. Where other bows rely on the strength of the archer, the crossbow has a mechanical trigger, so that many releases could be made without tiring the crossbowman. 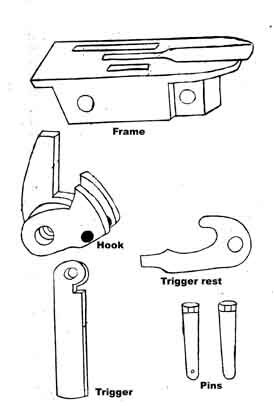 The Chinese development of the crossbow depended on bronze technology advanced enough to allow manufacture of accurately machined trigger-mechanisms. 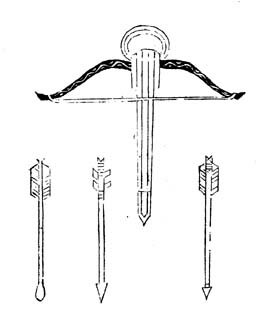 Early crossbows were portable and mostly operated by one archer. They became popular for the defense of royal entourages and for hunting; the later multiple-firing crossbows were intended for military campaigns. Crossbows were also used in the West. They were known to the ancient Greeks and Romans, and by medieval times in Europe, the crossbow had evolved into a powerful weapon capable of penetrating armor. 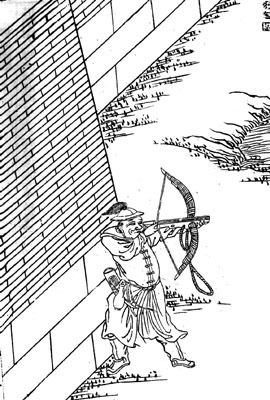 Chinese crossbows could pierce several layers of iron armor, but in China, where the defense and attack of walled cities was the primary focus of military campaigns, the crossbow was valued for its ability to deliver volleys of bolts even more than for its power to penetrate. 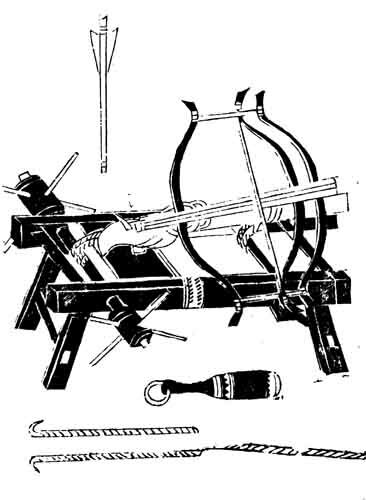 Crossbows remained one of the major weapons in Song times. 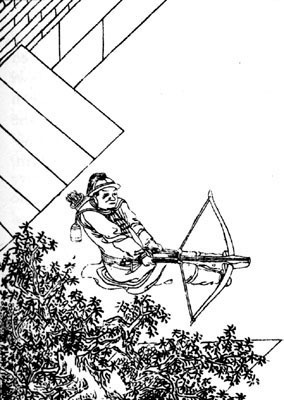 In the eleventh century, Shen Gua argued that the crossbow is to the Chinese what the horse was to the Khitan -- the asset that gave them their advantage. In field battles against foreign cavalry, the Chinese infantry would have a row of pikemen with shields, rows of archers, and a row of crossbowmen. When the cavalry approached, the crossbowmen would shoot first above the crouching pikemen and bowmen. The pikemen and archers would shield the slower-firing crossbowmen, who, however, could inflict more damage. 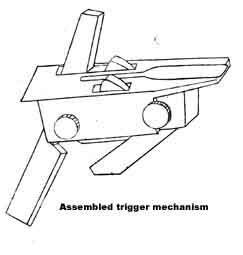 Below is a schematic drawing of the bronze trigger mechanism, including both an assembled one and the component parts. From the diagrams, can you see how this mechanism would have worked? 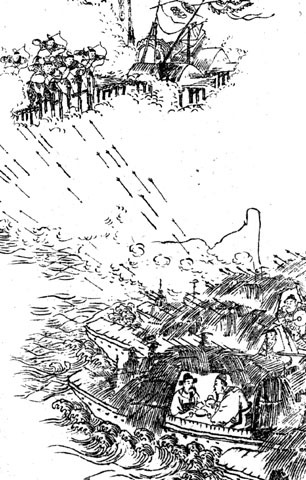 The scene on the left shows a famous story from The Romance of the Three Kingdoms. 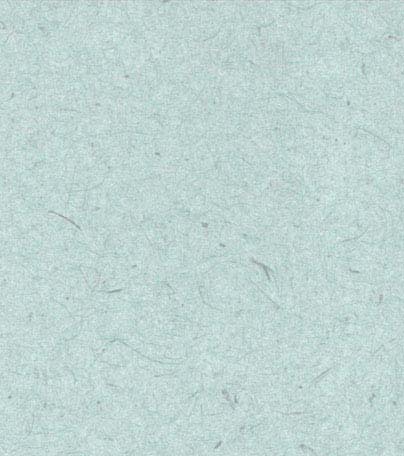 The Shu strategist, Zhuge Liang, successively "borrowed" 100,000 arrows from the rival state, Wu. With his arrows in short supply, he covered the Shu boats with hay, so that the arrows from Wu would stick and could be collected later. Although the crossbow was a very effective weapon, using one took training. Below are two crossbows that are armed in different ways. On the left, notice the loop hanging from the armed bow. By inserting his foot into the loop, the soldier could pull down the bow as he pulled up on the string until it caught in the trigger mechanism. On the right, the soldier uses a "belt-claw," which hooks onto the bowstring so he can pull it back into the trigger mechanism while pushing the bow away with his feet. Why would one method be preferred to another? To the left is a triple crossbow from the Song period. It would have taken as many as 20 men to operate and had an effective range up to 125 yards. The heaviest one was said to take 100 men to operate and had a range of 175 yards. Why would a composite crossbow requiring 100 men's strength but only having a range of 175 yards make sense if the one using 20 men's strength had a range of 125 yards? How could the effectiveness of bows be further increased? From very early times, soldiers wore armor and used shields to protect themselves from arrows. Horses, which were more important than ever when the Song was coping with the Jin and Yuan, were also armored. 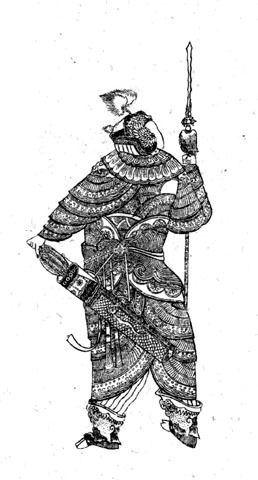 Note the elaborate armor worn by the two generals below. Armor was often made from the hide of a rhinoceros and then lacquered. So many rhinoceros were slaughtered for this purpose that the animal was largely wiped out in China and rhinoceros hide had to be imported. Can you tell from these pictures what other kind of materials were used to make armor and shields? As in Medieval and Renaissance Europe, military equipment was often embellished in ways that served no utilitarian functions. What can you infer from the style and craftsmanship of the armor, shields, and quivers shown below? 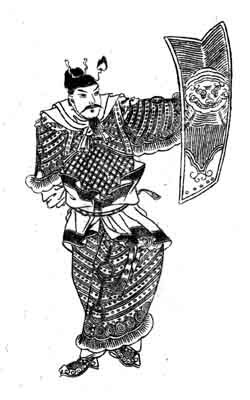 To the left is an illustration of a general wearing a helmet and armor and carrying a quiver. Below are diagrams of the front and back of a shield (left) and armor for horses (right). 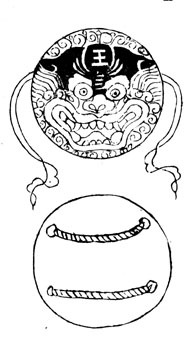 The face on the shield depicts a demon king.